Zosia S., TT Alumnae, Goranka Bjedov, speaker. 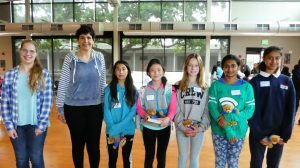 Palo Alto Campers: Cristina B., Alana F., Dana S., Vasuda D., and Melissa C. at the 2017 Tech Trek Camper Celebration Tea. Tech Trek is a week-long residential math and science camp for seventh grade girls, hosted and sponsored by AAUW California branches. The first Tech Trek camp was held in 1997 and the week long camps are now held at eight different college campuses throughout the state. Science, math, and technology are major fields where women are presently underrepresented but fields where they can and do succeed. The goal of Tech Trek is to provide a fun yet educational experience that will expand the minds of the middle-school girls who attend, allow campers to experience hands-on experiments and field trips related to math and science, live on a college campus, get acquainted with other girls who think science is fun, and meet female role models in math, science, technology, and other non-traditional careers. AAUW Palo Alto sponsors local girls at a Tech Trek camp on Stanford campus each summer. For information, go to the AAUW California website or contact Tech Trek, AAUW Palo Alto.